Διαβάστε την ελεύθερη πτήση στα ελληνικά εδώ. There are times in life when I want to shy away from everyone and everything. When there is no energy left, head empty, bones too heavy to move. When I was a child I could hide myself from the world by wrapping my arms around the neck of my mother or grandmother, closing my eyes and diving into their smell, feeling warm, cosy and protected. The world was forgotten immediately. But today I am a grown-up woman and hiding away has become more difficult. Sure, I have my different places to go to - be it a bar, a nice café and sometimes even a friend’s house. But it is not the same … and sometimes it takes a long time to reassure myself. So, over the years I had been wandering around to find my place of confidence and protection, a place that would feed my soul and my heart with the energy needed to move on, a place that patient enough to handle me, my moods and my various questions on life. Somehow, I was convinced that I would have to travel far to find THAT place, THOSE surroundings, THOSE people. But I was mistaken. I recognized it when I paid a visit to Ikaria in early spring time. It was still cold at night, the sea rough, but Mother Earth had already started to give birth again: a fresh green gleamed in the trees, and all kinds of flowers were pushing themselves out of the cold earth, bringing back a firework display of colours to hills and mountains. On sunny days the sea put on the brightest blue possible, giving the illusion that summer was already back. Hidden behind a rock, I sat watching the waves for hours. You know it: nobody can really escape the effects of “thalassotherapy”, but this time it was different for me. I felt like an empty vessel, no ingredients left to cook and to feed me. And at the same time all my senses were on high alert. So, I got to know to this whispering, no idea, where it was coming from – perhaps from the sea, perhaps from the mountains, perhaps from deep down in the earth. It was telling me: get up, I know what you need …. trust me, I will feed you. Sometime later I got up and started strolling around. The very nice thing on Ikaria is that I don’t really have to plan for the day. Somehow, I have learned to go with the flow. It was in that mood that I strolled around the island and recognized how well Lady Ikaria was nourishing me. Not by forcing me, but by putting me in places and in situations which comforted me. One day I was in the mountains, passing by the house of a friend. I just wanted to say hello, but she insisted that I come in. Within minutes I found myself by the fireplace with a bowl of a hot soup and some bread in my hand. The conversation was slowly developing; the long pauses in the discussion were giving us the pleasure to enjoy the silence together. Sometimes people do not really need words to have the most intensive exchanges. It was only after several hours that I left the house and, standing outside in the dark, realized that I could breathe again. Another day I was sitting in a corner of an old kafenion, watching the wind and the clouds outside, when I suddenly felt a warm hand on my shoulder. Old Kiria Eleni was standing behind me, her brown eyes focusing on my face. She was reading in it like a book, no need to talk. She stroked my hair, caressed my cheek and her warm eyes were telling me: “I know, my dear. Sometimes you must face tough times. But I know you, you will manage. You are a strong woman”. Then she left, leaving me a small bag stuffed with sage leaves. Outside she turned around, smiling at me and waving good-bye with her little wrinkled hand. I smiled back and all of a sudden, I recognized that my smile became broader and brighter, like a wave it flooded warmly over my body and with this move I cuddled like a little kitten into my chair, treasuring this short encounter with Eleni. I think I kept this smile till the end of the day and fell asleep with it like a happy little baby. 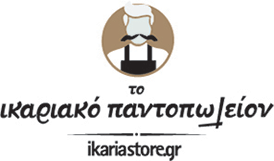 During the next days I learned again, how and where Ikaria intended to feed me. I opened up to new encounters and unexpectedly found myself surrounded by impressive people. People who were curious to meet me, but who were also happy to share their stories with me. Winter is a good time for story-telling and I became a patient listener. Perhaps it was destiny, but especially Ikarian women introduced me to their stories. “Sharing is caring”, and by telling me about their lives on the island and elsewhere, I was nourished with a lot of love, courage, laughter and wisdom. I learned about the herbs, the traditional recipes …. lessons they were given when they were kids out walking with their mothers and grandmothers on the old paths down to the fields…. and now they were passing their knowledge on to me - this stranger, who tried to absorb every detail. These women introduced me to their favourite places on the island and with a knowing smile they spread some details about first kisses and long nights at the beach. By the end of the day I felt filled up with an enormous energy, coming from different sources. It was a good feeling. I was given different examples of how life shook up these women around me, but I also got to know that Ikaria became their source of inspiration to move on. To be connected with nature, as they are, to know that you are part of a bigger picture … a feeling that gives them shelter, self-confidence and freedom. When I left the island, I kept the little bag with the sage leaves in my backpack. While travelling back to the big city I put my nose from time to time into these leaves, inhaling their perfume. And with every breath the pictures of the different places as well as the faces of the women came back to me, places and faces that had been my shelter over the last few days. It seems that for the moment I have found a place that protects me when I want to shy away from the world. It is good to know that Ikaria will mother me in its various and unexpected ways, giving me exactly what I need. Knowing this, I consider myself an extremely very rich person.